Fusco, Carla 2016. Female Factory Workers in Charlotte Elizabeth Tonna’s Quest. Gender Studies, Vol. 15, Issue. 1, p. 13. Healy, Meghan Elisabeth 2010. “Like a Family”: Global Models, Familial Bonds, and the Making of an American School for Zulu Girls. Safundi, Vol. 11, Issue. 3, p. 279. Prevost, Elizabeth 2009. Assessing Women, Gender, and Empire in Britain's Nineteenth-Century Protestant Missionary Movement. History Compass, Vol. 7, Issue. 3, p. 765. Cleall, Esme 2009. Missionaries, Masculinities and War: The London Missionary Society in Southern Africa, c.1860–1899. South African Historical Journal, Vol. 61, Issue. 2, p. 232. Manktelow, Emily 2009. The Civilising Mission and the English Middle Class, 1792–1850. The Journal of Imperial and Commonwealth History, Vol. 37, Issue. 2, p. 327. Prevost, Elizabeth 2008. Married to the Mission Field: Gender, Christianity, and Professionalization in Britain and Colonial Africa, 1865–1914. The Journal of British Studies, Vol. 47, Issue. 04, p. 796. Clark, Anna 2008. Editor's Introduction. The Journal of British Studies, Vol. 47, Issue. 04, p. 735. Rosslyn, Wendy 2007. Women in Russian Culture and Society, 1700–1825. p. 219. 1 Brontë, Charlotte, Jane Eyre (Harmondsworth, UK, 1966 ed. ), 424–34. The novel was originally published in three volumes under a pseudonym: Bell, Currer, ed., Jane Eyre: An Autobiography (London, 1847). 2 Cunningham, Valentine, “‘God and Nature Intended You For a Missionary Wife’: Mary Hill, Jane Eyre, and Other Missionary Women in the 1840s,” in Women and Missions, Past and Present: Anthropological and Historical Perceptions, ed. Bowie, Fiona, Kirkwood, Deborah, and Ardener, Shirley (Oxford, 1993), 85–108, quotes on 89, 97. 3 Spivak, Gayatri Chakravorty, “Three Women's Texts and a Critique of Imperialism,” in Feminist Postcolonial Theory: A Reader, ed. Lewis, Reina and Mills, Sara (Edinburgh, 2003), 306–23, quote on 311. 4 For works that focus on the later nineteenth century, see Huber, Mary Taylor and Lutkehaus, Nancy C., eds., Gendered Missions (Ann Arbor, MI, 1999); Semple, Rhonda Anne, Missionary Women, Gender, Professionalism, and the Victorian Idea of Christian Mission (Woodbridge, UK, 2003); Maughan, Steven S., “Civic Culture, Women's Foreign Missions, and the British Imperial Imagination, 1860–1914,” in Paradoxes of Civil Society: New Perspectives on Modern German and British History, ed. Trentmann, Frank (New York, 2000), 199–219; Rowbotham, Judith, “‘Hear an Indian Sister's Plea’: Reporting the Work of Nineteenth-Century British Female Missionaries,” Women's Studies International Forum 21, no. 3 (1998): 247–61; Gill, Sean, “Heroines of Missionary Adventure: The Portrayal of Victorian Women Missionaries in Popular Fiction and Biography,” in Women of Faith in Victorian Culture: Reassessing the Angel in the House, ed. Hogan, Anne and Bradstock, Andrew (Basingstoke, UK, 1998), 172–85. 5 Key studies include Kent, Eliza F., Converting Women: Gender and Protestant Christianity in Colonial South India (Oxford, 2004); Twells, Alison, “‘Let Us Begin Well at Home’: Class, Ethnicity, and Christian Motherhood in the Writing of Hannah Kilham, 1774–1832,” in Radical Femininity: Women's Self-Representation in the Public Sphere, ed. Yeo, Eileen Janes (Manchester, 1998), 25–51; Goodman, Joyce, “Languages of Female Colonial Authority: The Educational Network of the Ladies Committee of the British and Foreign School Society, 1813–1837,” Compare 30, no. 1 (2000): 7–19; the section on female missionaries in Morgan, Sue, ed., Women, Religion, and Feminism in Britain, 1750–1900 (Houndmills, UK, 2002). 6 Hall, Catherine, Civilising Subjects: Metropole and Colony in the English Imagination, 1830–1867 (Cambridge, 2002); Twells, Alison, “‘Happy English Children’: Class, Ethnicity, and the Making of Missionary Women in the Early Nineteenth Century,” Women's Studies International Forum 21, no. 3 (1998): 235–40; Thorne, Susan, Congregational Missions and the Making of an Imperial Culture in Nineteenth-Century England (Stanford, CA, 1999). 7 Gibson, Mary Ellen, “Henry Martyn and England Christian Empire: Rereading Jane Eyre through Missionary Biography,” Victorian Literature and Culture 27 (1999): 419–42; Peterson, Linda, “‘The Feeling and Claims of Little People’: Heroic Missionary Memoirs, Domestic(ated) Spiritual Autobiography, and Jane Eyre: An Autobiography,” in Traditions of Victorian Women's Autobiography (Charlottesville, VA, 1999), 80–108; Lamonaca, Maria, “Jane's Crown of Thorns: Feminism and Christianity in Jane Eyre,” Studies in the Novel 34, no. 3 (Fall 2002): 245–63. 8 deVries, Jacqueline, “Rediscovering Christianity after the Postmodern Turn,” Feminist Studies 31, no. 1 (Spring 2005): 135–55. 9 Stanley, Brian, The Bible and the Flag: Protestant Missions and British Imperialism in the Nineteenth and Twentieth Centuries (Leicester, 1990); Porter, Andrew, Religion Versus Empire? British Protestant Missionaries and Overseas Expansion, 1700–1914 (Manchester, 2004). 10 Prochaska, F. K., “Women in English Philanthropy, 1790–1830,” International Review of Social History 19 (1974): 426–45, and Women and Philanthropy in Nineteenth-Century England (Oxford, 1980). For testaments to the early importance of ladies' associations to the Baptist Missionary Society, see Missionary Herald, August 1820, 59; for testaments to the Church Missionary Society, see Stock, Eugene, The History of the Church Missionary Society (London, 1899), 1:243. 11 The respective dates at which the major English missionary societies made a formal decision to directly recruit women were as follows: Wesleyan Methodist Missionary Society in 1858, Baptist Missionary Society in 1866, London Missionary Society in 1875, and Church Missionary Society in 1887. In Scotland the United Presbyterian Church made the move in 1881. For specific societies, see The Women's Auxilary of the Wesleyan Methodist Missionary Society, The Story of the Women's Auxiliary, 1858–1922 (London, 1923); Stanley, Brian, The History of the Baptist Missionary Society, 1792–1992 (Edinburgh, 1992), 228–32; Lovett, Richard, The History of the London Missionary Society, 1795–1895 (London, 1899), 714–16; Is It Nothing to You? A Record of the Work among Women in Connection with the London Missionary Society (London, 1899); Macdonald, Lesley A. Orr, A Unique and Glorious Mission: Women and Presbyterianism in Scotland, 1830–1930 (Edinburgh, 2000), 115. For the Church Missionary Society and a general overview of the developments, see Maughan, Steven S., “Regions Beyond and the National Church: Domestic Support for the Foreign Missions of the Church of England in the High Imperial Age, 1870–1914” (PhD thesis, Harvard University, 1995), 259–327. 12 Founding constitution of the Baptist Missionary Society as quoted in Stanley, History of the Baptist Missionary Society, 233. 13 Murray, Jocelyn, “Gender Attitudes and the Contribution of Women to Evangelism and Ministry in the Nineteenth Century,” in Evangelical Faith and Public Zeal: Evangelicals and Society in Britain, 1780–1980, ed. Wolffe, John (London, 1995), 97–116; Valence, Deborah M., Prophetic Sons and Daughters (Princeton, NJ, 1985); Dews, D. Colin, “Ann Carr and the Female Revivalists of Leeds,” in Religion in the Lives of English Women, 1760–1930, ed. Malmgreen, Gail (London, 1986), 68–87; Anderson, Olive, “Women Preachers in Mid-Victorian Britain: Some Reflexions on Feminism, Popular Religion, and Social Change,” Historical Journal 12, no. 3 (1969): 467–84; Kenzle, Beverly Mayne and Walker, Pamela J., eds., Women Preachers and Prophets through Two Millennia of Christianity (Berkeley, 1998), esp. preface and chap. 15. 14 Piggin, Stuart, Making Evangelical Missionaries, 1789–1858: The Social Background, Motives, and Training of British Protestant Missionaries to India (London, 1984). 15 Hall, Catherine, “Missionary Stories: Gender and Ethnicity in England in the 1830s and 1840s,” in White, Male, and Middle Class: Explorations in Feminism and History (Oxford, 1992), 205–55; Hall, Civilising Subjects. 16 Stock, History of the Church Missionary Society, 124–25. 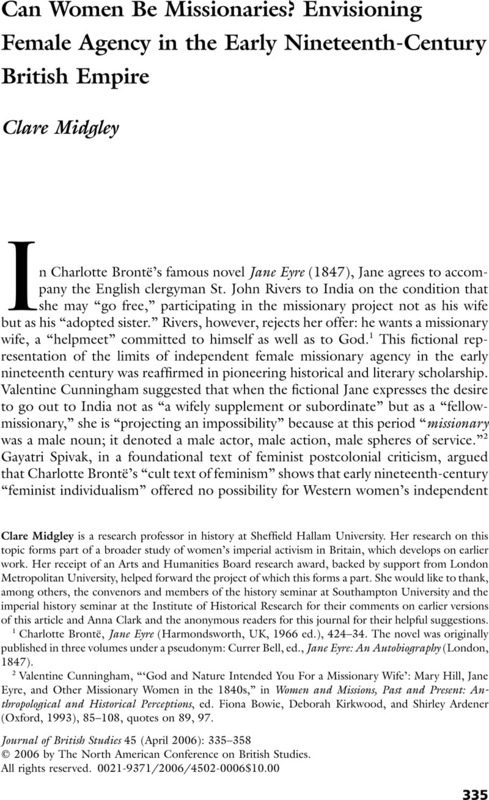 17 For a summary of these early developments, see Midgley, Clare, “Female Emancipation in an Imperial Frame: English Women and the Campaign against Sati (Widow Burning) in India, 1813–30,” Women's History Review 9, no. 1 (2000): 95–121. 18 Stanley, Bible and the Flag, 78. 19 Noel (1799–1873) was a clergyman in the Church of England until 1848, when he became a Baptist minister. He was an influential reformist Whig who opposed the Corn Laws and led pan-evangelical initiatives to evangelize the urban poor. See Carter, Grayson's entry on Noel in the Oxford Dictionary of National Biography (Oxford, 2004). 20 “Appeal,” in Society for Promoting Female Education in China, India, and the East (London, n.d.), 9–12, 13; History of the Society for Promoting Female Education in the East (London, 1847); The Twenty-Fourth Annual Report of the Society for Promoting Female Education in the East (London, 1858), 19–36, 16. For a brief overview of the activities of the society, see Donaldson, Margaret, “The Cultivation of the Heart and the Moulding of the Will: The Missionary Contribution of the Society for Promoting Female Education in China, India, and the East,” in Women in the Church, ed. Shiels, W. J. and Wood, Diana (Oxford, 1990), 429–42. The minutes and other records of the FES are preserved in the Church Missionary Society archive at the University of Birmingham (available on microfilm from Adam Matthew publishers). 21 This breakaway group was called the Female Society of the Free Church of Scotland for Promoting Christian Education of the Females in India. Swan, Annie S., Seed Time and Harvest: The Story of the Hundred Years’ Work of the Women's Foreign Mission of the Church of Scotland (London, 1937); Eighth Annual Report of the Scottish Ladies’ Association for the Advancement of Female Education in India, under the Superintendence of the General Assembly's Committee on Foreign Missions (Edinburgh, 1846); Rev.Duff, Alexander, More Fruits from India (Edinburgh, ca. 1848); The Eastern Females’ Friend, n.s., 3 (July 1857): 34. 22 Stock, History of the Church Missionary Society, 128. 23 Chapman, Priscilla, Hindoo Female Education (London, 1839). 24 History of the Society for Promoting Female Education in the East; prefatory note to a bound volume of The Eastern Females’ Friend, n.s., 1–19 (1857–61). 26 Memoirs of Mrs. Harriet Newell, Wife of the Reverend Samuel Newell, American Missionary to India (London, 1815). 27 Philip, John, DD, preface to Memoir of Mrs. Matilda Smith, Late, of Cape Town, Cape of Good Hope (London, 1824), vii–xvi. 28 Elbourne, Elizabeth, Blood Ground: Colonialism, Mission, and the Contest for Christianity in the Cape Colony and Britain, 1799–1853 (Montreal, 2002), 113–15. For a fascinating account of one African Caribbean woman's missionary work in the mid-eighteenth century, see Sensbach, Jon F., Rebecca's Revival: Creating Black Christianity in the Atlantic World (Cambridge, MA, 2005). 29 Judson, Ann H., An Account of the American Baptist Mission to the Burman Empire, 2nd ed. (London, 1827); Knowles, James D., Memoir of Mrs. Ann H. Judson, Wife of the Reverend Adoniram Judson, Missionary to Burmah, 9th ed. (London, 1838), 34, 35. 30 Winslow, Miron, A Memoir of Mrs. Harriet W. Winslow: Combining a Sketch of the Ceylon Mission; With an Introductory Essay by James Harrington Evans, Minister of John Street Chapel (London, 1838), x, xi. 31 Rev.Fairchild, A. G., comp., Memoir of Mrs. Louisa A. Lowrie, of the Northern India Mission: With Introductory Notices by the Reverend E. P. Swift, the Reverend W. H. Pearce, and the Reverend A. Reed, DD. Reprinted from the Second American Edition (London, 1838), 1, 4–5. 32 Harvard, W. M., Memoirs of Mrs. Elizabeth Harvard, Late, of the Wesleyan Mission to Ceylon and India: With Extracts from Her Diary and Correspondence (1824; repr., London, 1825), iii, 22, 52. 33 Ibid., 55, 57, 157. 34 Extracts from the Journal and Correspondence of the Late Mrs. M. M. Clough, Wife of the Reverend Benjamin Clough, Missionary in Ceylon (London, 1829), xxxv, 37. 35 Johnston, Anna, Missionary Writing and Empire, 1800–1860 (Cambridge, 2003), 147–55. 36 Ellis, William, Memoir of Mary M. Ellis, Wife of the Reverend William Ellis, Missionary to the South Seas, and Foreign Secretary of the London Missionary Society (London, 1835), lv, vi, 12. Ellis's second wife was Sarah Stickney Ellis, a highly successful author whose literary career he supported. She was the author of best-selling prescriptive tracts for women that combined an acceptance of women's social subordination with a stress on their moral authority in the domestic sphere. 37 Rev.Middleditch, T., The Youthful Female Missionary: A Memoir of Mary Ann Hutchins, Wife of the Reverend John Hutchins, Baptist Missionary, Savanna-la-Mar, Jamaica; And Daughter of the Reverend T. Middleditch, of Ipswich; Compiled Chiefly from Her Own Correspondence, 2nd ed. (London, 1840), 63, 69–72. See also Hall, “Missionary Stories,” 205–54. 38 Wilson, John, A Memoir of Mrs. Margaret Wilson of the Scottish Mission, Bombay, 3rd ed. (Edinburgh, 1840). 39 Memoirs of Female Labourers in the Missionary Cause (Bath, 1839), 25–26. Catherine Hall discusses a rather similar account relating to a woman who married a missionary to Jamaica—see Hall, “Missionary Stories,” 223. 40 Memoirs of Female Labourers; Thompson, Jemima, preface to Memoirs of British Female Missionaries (London, 1841), ix; Morison, John, The Fathers and Founders of the London Missionary Society (London, 1840). 41 Luke, Jemima, Early Years of My Life (London, 1900), 115–23. 43 The third was Miss Smith, one of the early agents of the FES in Bombay, and to her biographical entry Thompson appended some general information on the society, together with a list of the single women it had sent out to India and elsewhere. 45 Brontë, Jane Eyre, 434. 46 Luke, Early Years, 116. 47 Brontë, Jane Eyre, 477. 48 Luke, Early Years, 85, 108, 114–23. 50 Entry for Mrs. Jemima Luke, Dictionary of National Biography Supplement, 1901–1911, vol. 2; Luke, Early Years, 148–50. 51 Pitman, Emma Raymond, Heroines of the Mission Field: Biographical Sketches of Female Missionaries Who Have Laboured in Various Lands among the Heathen (London, 1880). 52 Davidoff, Leonore and Hall, Catherine, “Religion and Ideology,” in Family Fortunes: Men and Women of the English Middle Class, 1780–1850 (London, 1987), 71–192. 53 Lewis, Sarah, Woman's Mission, 2nd ed. (London, 1839), quotes on 12, 20, 128, 48, 11–12, respectively. 54 Amanda Vickery has suggested that such prescriptive tracts can be read not as evidence of the constriction of women's lives but as a defensive reaction against women's public activities: Vickery, Amanda, “From Golden Age to Separate Spheres? A Review of the Categories and Chronology of English Women's History,” Historical Journal 36, no. 2 (1993): 383–414. 57 Cox, Francis Augustus, prefatory essay to Female Scripture Biography: Including an Essay on What Christianity Has Done for Women, 2 vols. (London, 1817), xxiv, xcvi. 58 James, John Angell, Female Piety; or, The Young Woman's Friend and Guide through Life to Immortality (London, 1852). This consisted of ten sermons, the first of which was entitled “The Influence of Christianity on the Condition of Women.” This work had entered its 10th ed. by 1864. A note on p. 6 acknowledges its indebtedness to Cox's essay. 59 Mani, Lata, Contentious Traditions: The Debate on Sati in Colonial India (Berkeley, 1998). 61 “Appeal.” The text of this appeal was also published as app. B to the History of the Society for Promoting Female Education, where its author is named as the Reverend Baptist W. Noel (see 266–75). 62 Thompson, Memoirs, xv, lxxviii. 63 British and Foreign School Society, “Appeal in Behalf of Native Females,” Missionary Register, 1820, 434. 66 Report of the Glasgow Association for Promoting Female Education in the East (Glasgow, 1840), 7. 68 Missionary Register, 1815, 396–400. 69 Harvard, Memoirs of Mrs. Elizabeth Harvard, 94. 70 Noel, Baptist W., Duty of Christians towards the Female Children of India and the East (London, 1836), 43. 71 Kenzle and Walker, Women Preachers and Prophets, xix. 72 See the entry on Tonna by Lenard, Mary in the Oxford Dictionary of National Biography (Oxford, 2004). 73 , C.E., “China, India, and the East,” Christian Lady's Magazine 3 (1835): 540–42, quote on 542. 74 Lydia, , “China, India, and the East,” Christian Lady's Magazine 6 (1836): 498–502. 75 , G.H.G., letter to the editor, Christian Lady's Magazine 7 (1837): 241–43. 77 , J.S., letter to the editor, Christian Lady's Magazine 7 (1837): 540–43. 78 Thompson, Memoirs, ix; History of the Society for Promoting Female Education in the East, 1; Female Agency among the Heathen, as Recorded in the “History and Correspondence of the Society for Promoting Female Education in the East” (London, 1850); The Female Missionary Intelligencer and Record of the Proceedings of the Society for the Promotion of Female Education in China, Africa, and the East (1854), see esp. 1:108, 186, 188. 79 The Female Missionary Intelligencer 2 (1855), 49–50. 80 The English Woman's Journal, the earliest English feminist journal linked to the Langham Place Circle, which began publication in 1858, makes no reference to the work of British Protestant missionary women (although it does include information on Christian educational work by a Catholic woman in the French colony of Algeria). 81 For the classic discussion of early “imperial feminism,” see Burton, Antoinette, Burdens of History: British Feminists, Indian Women, and Imperial Culture, 1865–1915 (Chapel Hill, NC, 1994).